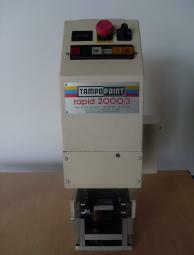 The "RAPID 2000/60-3" is a top performance pad printer with control SPS and interface for the integration in a automatic line. The purely mechanical curve-steered impulse is robust and very reliable. As a specially obstructed vertical adjustment allow a very good adaptation to the workpiece.